Barbie’s, simply put, set impossible, unrealistic standards. One of the websites I was looking at said it well: This children’s toy was first debut in 1959, and she was the ideal role model for all girls, or so it seemed. She was perfectly skinny, had a perfect boyfriend and family, perfect hair, perfect house, perfectly… perfect. Yet how was this perfect doll impacting the millions of young girls (older girls, too!) who were playing with her? This is the clear effects: It’s estimated that 8 million people in the United States has an eating disorder, and only 10-15% of them are male. Which leaves the 85- 90% of them to be female. And 80% of those females are under the age of 20. How? you ask. Why? Well, besides the point that no real lady (2014 – 1959 = 55) in her fifties should look that young, with perfect skin, not a single blemish at all, it’s important to note that the figurines have horribly wrong proportions! People argue over whether her life-size body would 5’ 6” or the extreme 6’ 8”, but let’s face it, when you add in her weight- the “Slumber Party Barbie” came complete with a bathroom scale permanently set at 110 pounds- she is significantly underweight. 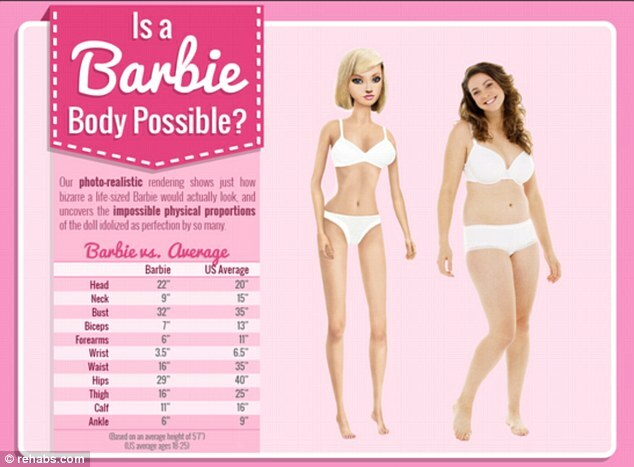 You see, neither normal folk, models, or anorexics can have a body that set at “Barbie Standards”, you wouldn’t even want one. The ones that seem to be, as in media, are photo-shopped and fake! You can refer also here to see biblical scriptures on the topic. And finally, here you are with a question and that video I mentioned: What messages did/does Barbie send to you? I don't know what they teach in public schools here in California about healthy eating, but most of the girls are super twigs! You know they don't eat right to be that skinny skinny. I look at these girls and wonder what would happen to them if they got terribly sick. I think in schools that there is a whole lot of body image problems among the girl population. And yet the school itself does nothing about it, where as they do obesity.